Great News!! You Don’t Need to “Engage” Customers Anymore!!! 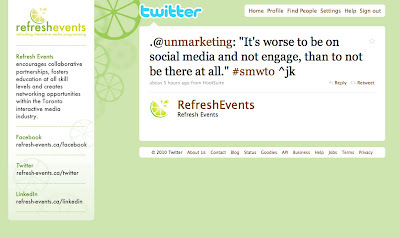 I am writing this post from the world famous Roger Smith Hotel in NYC and the only reason I mention this is so you realize at the beginning that I was not in attendance at the event I am referencing in this post and as well I would like to say that even though I am using an example by @unmarketing I would like to say that if you read the post you will see I am not starting up with him but attempting to show another point of view to his comment in the effort to demonstrate this is an ever evolving space with the need for some fresh eyes. I should also mention that I don’t know Scott except for on Twitter and haven’t met him in real life so this may not be fair but I am in no way attacking him. I am sure Scott is a nice guy and he is only in the post because he inspired it…and as always, these opinions are mine and mine alone. What I am saying is that not even my mom wants to be associated with some of nonsense. Last night as part of Social Media Week in Toronto, Scott Stratten spoke on the subject of Social Media at The Refresh Events gathering. I can’t comment on the event or Scott’s ability as a speaker because I wasn’t there but I did see some of the tweets that came out from it and one specifically caught my eye. This is a bold statement and one that I don’t agree with. Sure conventional Social Media wisdom says you need to respond to every comment and engage your community but since there is nothing really conventional about Social Media there can’t really be conventional wisdom…or to phrase it differently, there can’t be any hard and fast rules because every situation is different. Under certain circunstances I advise companies not to engage their customers because there is no one on the team who has the correct personality/passion/disposition to do this sort of stuff. Communications is about comfort and confidence and if you don’t have that person on your team you should not be putting people in a position to fail because that is just not fair. BUT <---- I made that all caps because here comes the part that makes me look really smart and I wanted you to notice. Even without true engagement you can still make a noticeable difference in customer care and activate customers to become more loyal and tweet about their level of satisfactions by simply listening super closely to their needs and make the necessary (if any) changes…then once the changes are made you let your customers notice on their own and let them draw their own conclusions to how or why the product or service is suddenly better. People are smart and they will notice your work. Well because just about every speaker on the Social Media speaking circuit says some version of “Your customers are talking about you weather you engage or not so you better get in there and engage” (I know because I say it in my presentations) so an assumption can be made by that logic that they will continue to talk about the “new” you and spread the word and by just listening you can still do your brand good and not ask your staff to do something they are not equipped to handle. I… pretty much agree with you, Saul. Bold pronouncements make for great presentations, and I'll certainly argue that engaging with your customers is better than not engaging with them, but it's absolutely possible for a company or brand to have a positive image in the social media sphere without talking to people. Is it as good? No. But is it better than nothing? If done right, absolutely. If I were in the position to consult brands on what to do with social media, step one would always be "Put yourself out there and demonstrate that you know your shizz. People will notice and think of you as a reputable source of unbiased info on ." Once you've done that, engagement is great, but without the first step, you're only banking on the good feelings of "ooh, this company's interacting with me!" I wasn't sure where you were going with this at first, but now I see and agree ; ) People call out companies who're on Twitter, Facebook, etc., but don't respond to folks talking about them all the time. I'd way rather see something changing based on what company reps are hearing that see a static page any day. Another bold, statement, this one by Saul: "Communications is about comfort and confidence and if you don't have that person on your team you should not be putting people in a position to fail because that is just not fair." Could not agree more. Having read and thought about your post, the rest of your blog, and your tweets, I would add something you demonstrate clearly every day: great communications is also about creativity. And that's not easy for everyone, and can be a scarce resource especially in the context of smaller biz where folks just might not have the time required for engaging SMM. Thanks Saul, for your always insightful advice and fresh perspective. I think both you and @unmarketing are correct. I want the companies that I do "business" with to engage with me and others via social media. Why? Cause I'm too damn busy working, writing for Techvibes and otherwise trying to figure out the secrets of the universe. If I complain and all Primus (as an example, Ahem.) does is fix it and not tell me about it, guess what? I assume the problem is not fixed and/or they don't care to communicate. I'm still waiting to hear from Primus. Have they fixed my problem? I have no clue. It's like the girl who you think never called back. She did! But your mom never gave you the message. If only she tweeted you…. There are times when engagement is necessary and times when it is not. I would agree with you in the case of complaining that the heat is not working. Once it's fixed I intuitively know. Saul, as usual very thought provoking blog post. I will have to agree with Karim that both parties are correct. Social media has enabled companies to hear what is being said about them behind there back. This information is invaluable to many organizations. Thus all organizations should have some presence. However, social media has also given consumers another venue to broadcast their feelings. A lot of the times directly to the company. If you have a social media presence and a consumer is directly contacting you via a social platform, you have an obligation to respond. Otherwise it is straight up rude. Especially if it is negative sentiments as they will undoubtedly spread. But again, Saul, I do understand your stance. We have two ears and one mouth for a reason. While many organizations forget this and jump into the engagement stage right away. Listening is always the first and most important step.